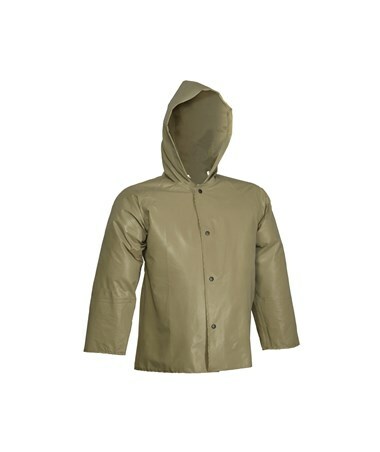 This Flame Resistant Magnaprene Liquidproof Jacket, is a comfortable, general purpose, rain jacket. It’s both flame resistant and chemical resistant, while keeping you comfortable with its generously cut batwing sleeve construction, for maximum freedom of movement. This jacket has been put through testing guaranteeing its quality in regards to, safety and comfort, and is also practical for many other forms of work. Manufactured of 9 oz., single coated neoprene on nylon, with seams that are stitched, and taped, making it 100% liquid proof. Moreover, its storm flap on the front of rain jacket, will seal out wind and rain to the max. Flame resistance is, self-extinguishing with flameout and afterglow less than 2 seconds after removal of ignition source, test method ASTM D6413. Its neoprene coating makes it chemical resistant, preventing the jacket from getting damaged when coming in contact with many, acids, oils, alcohols, salts and alkalies. Additionally, it’s mildew resistant, which means that it prevents mold from developing on the rain jacket, protecting it, so that it lasts a long time. Jacket is lighter than standard neoprene jackets, yet, just as durable as them due to it being manufactured with an innovative new process making it more flexible, so that it’s comfortable to wear. Hood attached to protect head from rain, and is also good for added warmth on windy days, so that you can cover your head and ears which is known to keep body warmth from exiting. This jacket also comes along with heavy duty snaps that seal out wind, rain, and liquid, and comes along with corduroy tip collar, for added neck comfort. Ideal Jobsite Applications: Forestry, Mining, Fishing, Petrochemical, Chemical and Off Shore Drilling. With that said this jacket, besides its water resistance, it is flame resistant, chemical resistant and mildew resistant, which will allow you to work at ease, knowing you, and your jacket, are protected against any sort of toxins etc., and is from the most protective and durable of jackets available. 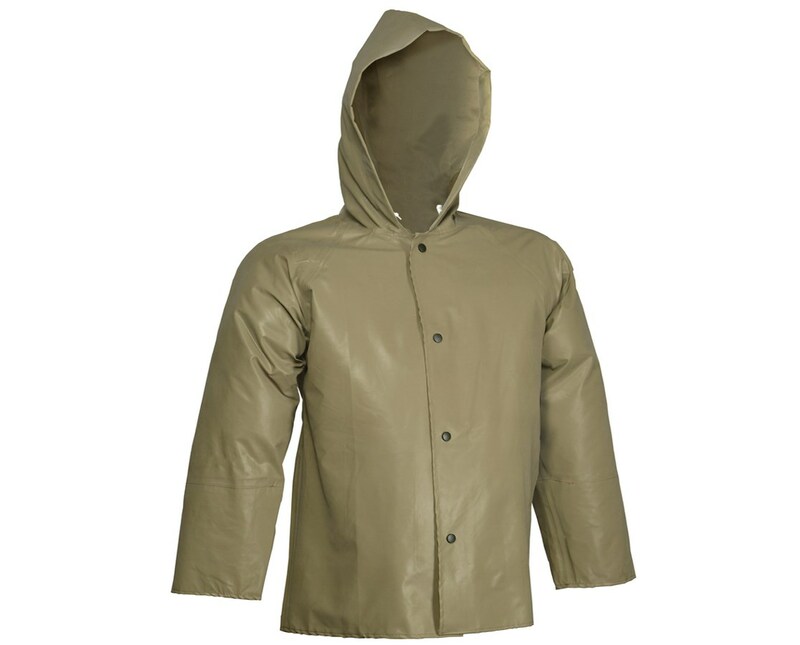 Comfortable general purpose jacket that’s also flame resistant and chemical resistant. Jacket has been put through testing guaranteeing its quality in regards to safety and comfort. It's lighter than standard neoprene jackets, yet, just as durable as them due to it being manufactured with an innovative new process. Manufactured of 9 oz., single coated neoprene on nylon with seams that are stitched and taped, making it 100% liquid proof. Together with the storm flap and heavy duty snaps on front, the jacket will seal out wind and rain to the max. Flame resistant and self-extinguishing with flameout and afterglow less than 2 seconds after removal of ignition source, test method ASTM D6413. Additionally it is chemical resistant to many acids, oils, alcohols, salts and alkalies. Hood attached to protect head from rain and is also good for added warmth on windy days so that you can cover your head and ears which are known to keep body warmth. Batwing sleeve construction generously cut for maximum freedom of movement. Also includes corduroy tip collar for neck comfort. Forestry, Mining, Fishing, Petrochemical, Chemical and Off Shore Drilling.